The Golddiggers of Rat Pack fame celebrate life and strike a pose! From left to right: Susan Buckner, Deborah Pratt, Maria Lauren (Alberici Sisters), Linda Eichberg (Alberici Sisters), Marie Peck, Patti Gribow, Peggy Gohl and Darlene Cianci (Alberici Sisters). When girlfriends celebrate together, it is pure joy! My girlfriends are a colorful bunch of personalities as we tap into our inner diva which touches on the divine! We have a history together, starting as singers and dancers on the Dean Martin Show. We were just babes! Sneak a peek at our book on Amazon! Beyond Our Wildest Dreams tells of our escapades during the golden age of show business when the Rat Pack and Elvis ruled the Las Vegas strip! Through the years, we worked and played together and in between, we lived life, broke-up with boyfriends, got married, got divorced, had babies, watched them grow, applauded their achievements and watched them get married. Such was this occasion. My sister’s daughter, Lindsay was getting married! It was a grand affair partying with my dear friends and family too! It’s so important to have people in your life that have witnessed your ups and downs and are there for you as you turn the page of another chapter. I found you just can’t beat sharing your life story with sisters, girlfriends and gal pals! For that, I’m truly grateful. Lady Luck steps into Las Vegas when the Rat Pack ruled the strip but also sizzles in today’s Las Vegas! Lady Luck has been charmed by Frank Sinatra in the song, ‘Luck be a Lady,’ she has a downtown Vegas casino named after her and she is the subject of a new music video sung by recording artist, Marianna Riccio and directed/edited by award-winning videographer, Harry J Jarvis. Singer, songwriter, Marianna Riccio is ‘Lady Luck’ in new music video! Because of our connection to the artist, 😉 my sister and I (Alberici Sisters) also make a few appearances in the Lady Luck music video… our book is featured too! Our historical entertainment book was prompted by a newspaper reporter who interviewed us on the Red Carpet at The Grammy Award Ceremony. We were there to honor Dean Martin receiving a Lifetime Achievement Award because of our many years performing with Dean as The Golddiggers. “As we celebrated that evening, it all came flooding back—the stars, the memories…. Touring with Frank Sinatra and Dean Martin on the same bill, hanging out in the dressing rooms and at home with Sammy Davis Jr.; taping the Dean Martin TV show; opening the MGM Grand in Las Vegas with Dean and then appearing at Bally’s for so many years until Dean’s final performances. What an experience. What fun! Spending all of that time in Las Vegas with Dean opened our eyes to who the legendary entertainer really was on a personal level; the man behind the laughter. And the sorrow. – Excerpt from “Beyond Our Wildest Dreams, book by the Alberici Sisters, produced by Billy Ingram. My daughter, Marianna grew up watching Dean Martin and The Golddiggers on-stage in Las Vegas! 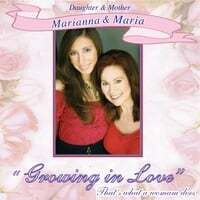 Maria Lauren (mom) poses for a picture with Marianna Riccio (daughter) before a performance in Las Vegas. Marianna Riccio performs the song, Lady Luck in honor of the glamour days of Las Vegas! “A STAR IS BORN… This is so amazing… What a beautiful talent!” … “You make me want to go to Vegas – NOW!! !”… “What a hoot!” … “Great song and video.” … “Awesome!” … “Entertaining and fun!” … “Fantastic song… Looking ladylicious Marianna Riccio!” … “Retro cool! !” … “Catchy tune!” … “It is more than great!! !” …. My sister Linda and I were more than pleased to sing a little snippet of ‘Luck be a Lady’ in the Lady Luck music video as our hearts commemorated 100 years of Frank Sinatra! Now, a whole new generation can take notice. 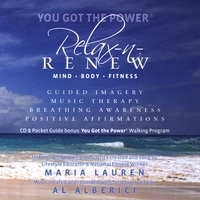 Maria Lauren – Motivational Host for Your Powerful LIFE.